The Comet Goldfish is an elongated, flat-bodied variety of goldfish. It has a wide but short head, and its body tapers smoothly from its back and belly to the base of its caudal fin (tail fin). Its caudal fin is long and deeply forked and generally stands fully erect. They live up to 14 years or more, depending on how well it is kept and the prevailing conditions. In terms of size, it is slightly smaller than the common goldfish, but this depends also on the prevailing conditions. They can grow up to 12 inches (30+ cm) depending on the size of the tank and the other conditions. They are primarily a reddish orange color, but they are also available in yellow, orange, white, and red. Some however have a bi-color red/white combination, and occasionally they are available with nacreous (pearly) scales, giving them a variegated color. Comet Goldfish are some of the hardier species of goldfish. They are very undemanding of water quality and temperature. They can do well in a goldfish aquarium or even a pond as long as the environment is safe and their tankmates are not competitive. 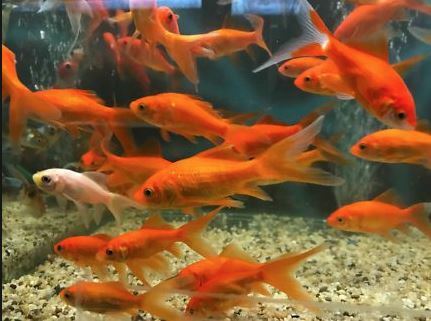 Many people will keep goldfish in an aquarium with no heater or filtration, but for the best success, provide them the same filtration, especially biological filtration, that other aquarium residents enjoy. These goldfish are hardy and easy to keep in a well maintained tank. Minimum tank size is 15 gallons. Snails can be added as they reduce the algae in the tank, helping to keep it clean. Water change should be done weekly. This is because Comet goldfish produce more waste than most other freshwater fish and benefit greatly from more frequent water changes. Good filtration, especially biological filtration, is very helpful in maintaining the water quality of the aquarium. A filtration system will remove much of the detritus, excess foods, and waste, which keeps the tank clean and maintains the general health of the goldfish. 1. Ich. This is a protozoan disease which is easy to identify because it makes the fish look like it is sprinkled with salt. Though Ich is easily treated, like other protozoan diseases, it can be fatal if not caught quickly. Some other protozoan diseases are Costia, which causes a cloudiness of the skin, and Chilodonella, which will cause a blue-white cloudiness on the skin. 2. External parasites. These are common but are easy to treat and are normally not fatal when treated. They include flukes, which infest the gills or body of the fish, fish lice (Argulus) that attach themselves to the body of the goldfish and finally anchor worms which resemble threads coming out of the fish. 3. Bacterial infections. They include Dropsy, an infection in the kidneys that can be fatal if not treated quickly. Fish Tuberculosis is indicated by the fish becoming emaciated (having a hollow belly). For this illness, there is no absolute treatment, and it can be fatal. Tail/Fin Rot may also be bacterial, though the reduced tail or fins can be caused by a number of factors as well. There is also fungus, a fungal infection, and Black Spot or Black Ich, which is a parasitic infection. 4. Swim Bladder Disease. This is an ailment indicated by fish swimming in abnormal patterns and having difficulty maintaining their balance. This can be caused by a number of things: constipation, poor nutrition, a physical deformity, or a parasitic infection. Feeding frozen peas (defrosted) has been noted to help alleviate the symptoms and correct the problem in some cases.